The Annual Giving Campaign has kicked off. Our goal for the 2017-2018 campaign is $80,000. The funds raised provide tuition assistance to families who otherwise could not attend St. Leo Catholic School. Thanks to last year's donations, we provided tuition assistance to 38 students to attend this school year. While impressive, there is far greater need than we can meet. 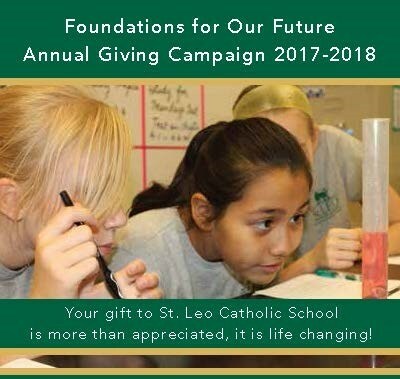 Help us give the gift of a Catholic education to every student who wants to attend St. Leo Catholic School. Give today.